Thanks to donor support in the US and China, Baby Love's (Li Qing's daughter) first stage of treatment is completely paid and the second stage is currently taken care of as well. A group of loving moms have donated formula; there are many donating diapers. This group effort has saved this little girl! We will update when her last surgery is complete, when she is able to return home. Seven days after giving birth to her pre-term baby daughter*, Li Qing died. Now her baby’s life is in danger. She was born with rectal atresia, which is a blockage in the bowels. Two surgeries are needed so the child can survive. After the first operation was performed, the hospital was going to discharge her, even though she only weighed three and a half pounds. The father had exhausted all his savings in paying the hospital for the attempt to save his wife’s life and, for his daughter’s special post natal care and surgery. He was out of money, so the hospital told him they could no longer treat his daughter. Children’s Hope-China was called to help. Melody Zhang, CHI Beijing Director, went to meet the father and his new baby at the hospital. She was impressed with the father’s desire to do what it takes to save his daughter’s life. Children’s Hope will help in this fight for life. 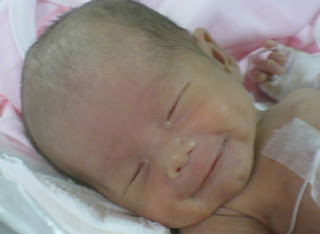 Li Qing’s baby is now waiting to get healthy enough for the second surgery. This is called a "Phase II esophageal atresia surgery" and will cost around 20,000RMB ($3000) - plus the hospital stay and the 20,000RMB ($3000) for the first surgery. Total expenses will get close to $15,000.